Rhododendron is a genus of non-native evergreen and deciduous trees or shrubs. The name “rhododendron” is Greek and literally means “rose tree”, which is fitting, given the marvellous, colourful flower sprays that make rhododendron varieties highly popular as ornamental plants. These plants have a long tradition in our part of the world, dating back to the Victorian era, during which they were very popular among wealthy landowners. As a result, many hybrids and cultivars have been developed over the course of the last few centuries and the rhododendron is now a very common sight in gardens all across Europe and the UK. The varieties described on our website are all evergreen rhododendron varieties that are ideally suited for hedging purposes. It should come as no surprise that rhododendrons have been used for hedging or as stand-alone specimens for a long time and still enjoy undiminished popularity. Rhododendrons are simply fabulous hedging plants. Of course, their aesthetic value is immediately apparent, but as most rhododendron varieties commonly used for hedging will reach an ultimate height of about 2 metres, they make very decent privacy hedges as well. While rhododendron can be a little picky about soil types and positions, they require surprisingly little maintenance. It is not strictly necessary to prune a rhododendron hedge, though it is certainly possible to do so. If you put a little effort into planting them correctly and into picking the right spot, rhododendron hedges will reward you handsomely. The rhododendron genus is a large one, as about 1,000 species exist worldwide. Though the name of the genus is Greek, it is likely that most rhododendron species originate from the Far East, as the Chinese were already cultivating rhododendron over 2,000 years ago. Also, the azalea, a colourful plant which is highly popular in Japan, is considered to be a subgenus to the rhododendron. 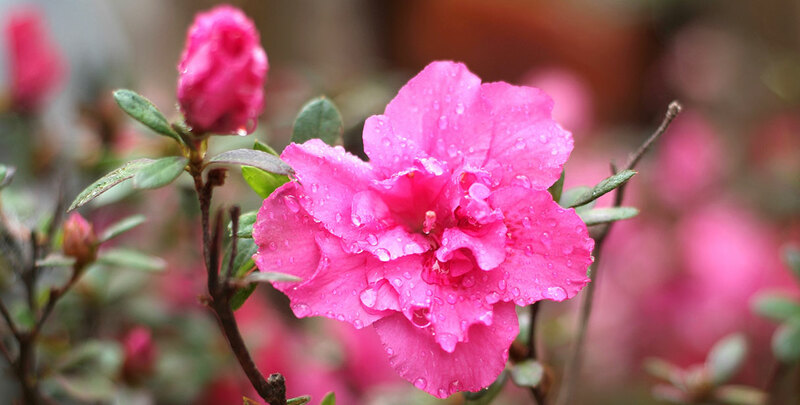 In the past, some botanists have considered azaleas and rhododendrons to be different genera, but apart from the fact that azaleas only have five anthers – rhododendron species can have up to 27 of them – there are no significant differences between the two. Both are plants with vibrant flowers that will enliven any garden. Some rhododendron species are native to North America. There, they occur in the wild in the Appalachian Mountains and on the west coast of the United States, where they have become widely appreciated for their hedging qualities. As all parts of most rhododendron plants are poisonous enough to kill grazing animals within hours after consumption, plants from this genus are generally only used for their ornamental value, though the wood of a rhododendron does make a decent firewood when properly treated. The fine grain of rhododendron wood makes it relatively easy to carve and its blond colour gives it a striking appearance, but we would not recommend carving utensils or bowls out of them. We also advise you to be cautious with animals around a rhododendron hedge. Rhododendrons are relatively picky about their location and soil type when compared to many other hedging plants. They require a sheltered position with little wind, ideally in semi-shade, though a position in the sun will generally not do a rhododendron hedge any harm. This species needs a moist, but well-drained soil and does not tolerate drought. Moreover, the soil must be at the lower end of the pH scale and rich in organic matter. 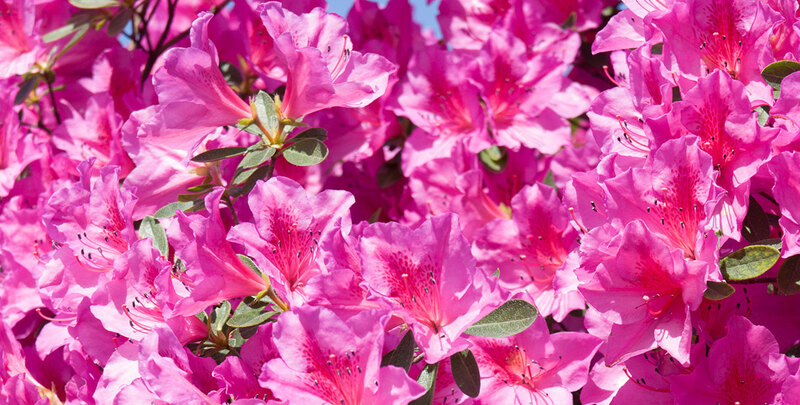 Very alkaline soils are not suitable, as rhododendrons require acidic soils. 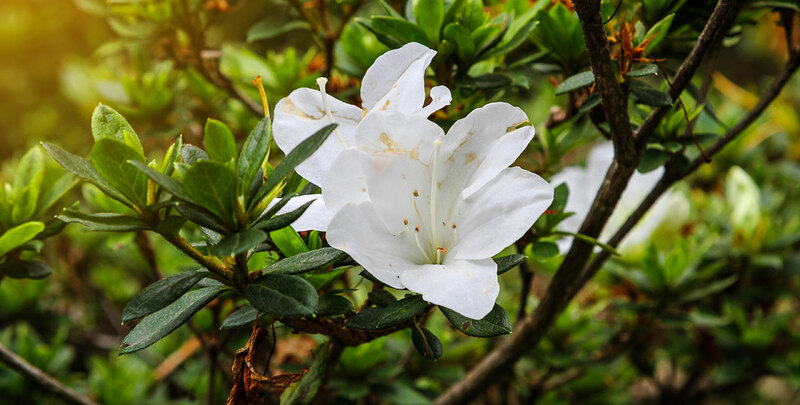 Slightly alkaline or neutral soils are fine, as long as you mix in a so-called ericaceous fertiliser or suitable compost for rhododendrons when you plant them. You can also make your own by blending well-rotted leaves with bark and rotting pine needles. Make sure that you do not plant your rhododendron hedge too deep, as rhododendrons have surface roots. After they are planted, the soil should remain moist, especially during summers. Rain water is ideal, but if necessary, tap water will also do the job, despite usually being more alkaline than rain water. On the other hand, rhododendron hedges do not require pruning. You could, however, trim your hedge back to older wood in case it starts to get too large. If you choose to do so, your rhododendron hedge will not produce any flowers during the following year. However, its beautiful, dark green leaves will certainly sprout again. In addition, rhododendron hedges can be deadheaded after flowering to stimulate growth. 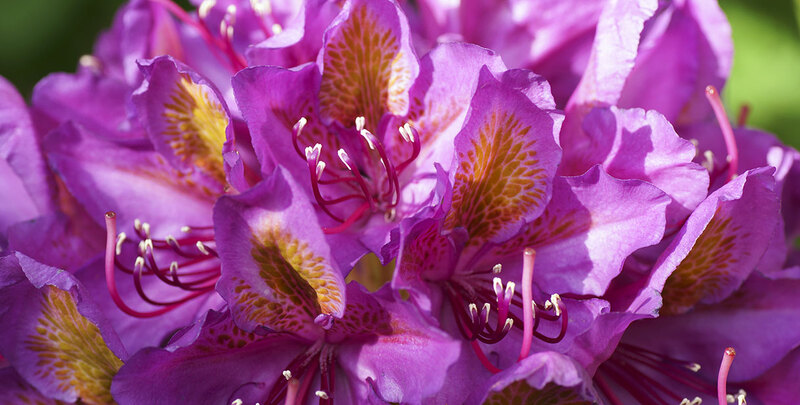 Rhododendron hedges have an average annual growth rate of 20 to 30 centimetres. Very few evergreen hedging plants are as vibrant and colourful as rhododendron. During springtime, your rhododendron hedge will produce gorgeous, dense trusses of flowers, which is undoubtedly the main reason why many garden enthusiasts will make the effort to plant rhododendron. There are many varieties with different colours available. You could choose to plant a rhododendron hedge which will produce flowers of which the colour appeals to you the most, but they are even more fabulous when several varieties are combined. Combining different varieties with consecutive flowering periods in a mixed hedge will create a prolonged flowering season. If you follow the planting instructions of a rhododendron hedge carefully, you will be rewarded with a hardy, fabulous, informal and low maintenance hedge. The flower trusses will certainly make any garden a little more colourful, but the dark green foliage is also not without its aesthetic value. If colour is what you are after, a rhododendron hedge is the ideal evergreen hedge for your garden.